Described as “nature's greatest experiment” by Sir David Attenborough, the Galápagos Islands offer a once-in-a-lifetime travel experience. To celebrate the launch of their brand new Galápagos Odyssey, adventure cruising specialists Aurora Expeditions share their favourite things to do and see in one of the world's wildest archipelagos. Take a geology lesson – hike up Española Island's four-million-year-old volcano, hop on 100-year-old cactus-dotted lava fields on Bartolomé Island or take the 600-metre walkway up to the hills for a stunning view of the sea-cooled hot lava formation Pinnacle Rock. Grab your snorkel – jump into the warm, crystal clear waters and let marine creatures guide you through the islands' spectacular underwater world. Sea lions playfully nibble at your fins, sea turtles peacefully swim alongside you, and if you don't fancy a dip, there's always our glass-bottom boat! Pick up the post – visit Floreana Island's first Post Office: a wooden barrel left by English whalers in the late 1700s in which men heading out to sea would deposit their letters for sailors returning home to collect and deliver. The system still works on the same premise today; see if you can find a letter to hand deliver! Meet an icon – the world's oldest yet endangered animal, the Galápagos giant tortoise is a conservation icon. Learn all about the local giant tortoise breeding programs and pay tribute to late 'Lonesome George', the last of the Pinta Island giant tortoises, and icon of the conservationist movement. Sunbake on green sand – Experience a new kind of beach on the green-sand beaches of Punta Pitt (San Cristobal) and Cormorant Point (Floreana). They get the green tint from the olivine crystals found in the sand, and offer splendid photograph opportunities. In the footsteps of Darwin – join Aurora Expeditions' team of naturalists and learn all about the unique history of the Galápagos Islands through lectures, talks and shore excursions that will shed light on Darwin's theories and observations that redefined the modern-day understanding of how today's species came to be. 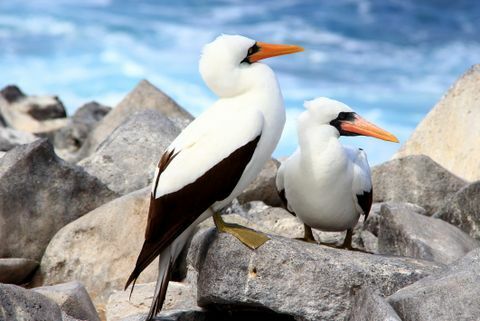 Serious bird watching – did you know that San Cristobal Island is the only place on Earth where you can see three species of boobies – the red-footed, blue-footed and the Nazca booby – nest and cohabit together? Swallow-tailed gulled, flamingo, finch, pintail duck, flycatchers, Galápagos hawk, frigatebirds, stilts, egrets and more also await avid twitchers. Don't forget your binoculars! Newly added to Aurora Expeditions' Ecuador program, the Galápagos Odyssey offers a rare chance to discover the best of the Galápagos Islands on a small ship. Sailing aboard 38-passenger Isabela II, travellers will be joined by a team of naturalists and wildlife specialists and explore the archipelago over nine days, jam-packed with Zodiac and shore excursions, incredible wildlife encounters, interpretive talks and lectures and complimentary kayaking and snorkelling. Starting from US$6,635 per person, the Galápagos Odyssey departs Baltra in the Galápagos on 3 October 2016 and includes 8-night accommodation with meals, return flights from Quito, Ecuador, airport transfer (Galápagos only), all shore excursions and land tours, onboard lectures and kayaking and snorkelling activities and equipment. For more information call Aurora Expeditions on 1300 061 490, emailinfo@auroraexpeditions.com.au or visit www.auroraexpeditions.com.au.